Work in Mexico and Latin America requires specialized knowledge and expertise. In addition to language fluency, an understanding of cultural nuances is critical in confirming market data and producing market-based analysis and appraisals. Market data resources are often fragmented and market data confirmation requires specialized skills. 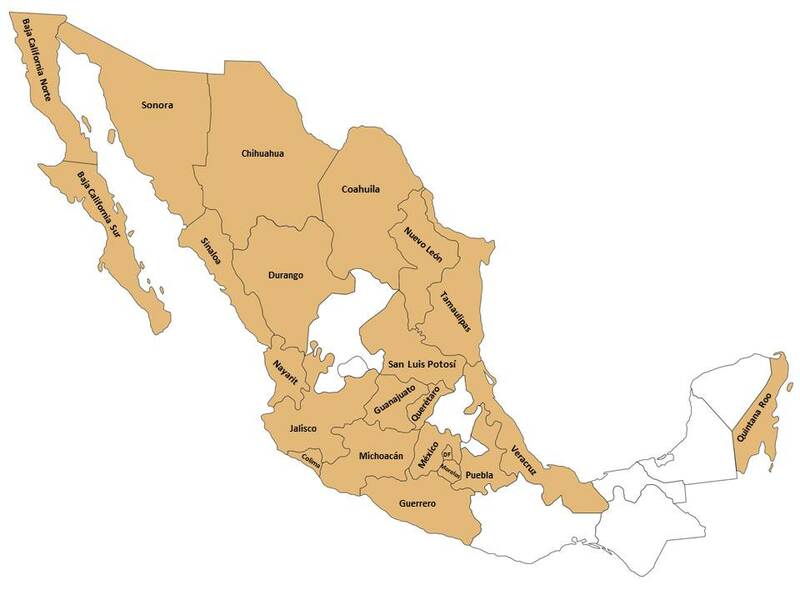 States in Mexico in which we have worked are highlighted in tan. Assignments in Mexico comprise a growing portion of our practice, with more than 30 assignments complete in 2012—more than double the average number completed in prior years. Franklin Flato, MAI, has extensive appraisal experience in Mexico as well as Honduras and Puerto Rico. His consultation assignments have included properties in Panama, Brazil, Chile and Belize. From 2005 through 2011, Mr. Flato served as Ambassador and Chief Delegate to Mexico for the Appraisal Institute. He served as Treasurer for the Union Pamamericano de Associaciones de Valuacion (UPAV) from 2010 through 2012. In this capacity he worked with each member country from Latin America and Spain. Work often is related to mortgage financing, corporate asset valuation, acquisitions and marketing, law suites, site selection, and estates. Property types appraised include industrial manufacturing, warehousing and industrial subdivisions/parks; luxury residences, luxury residential subdivisions, resort and business hotels; commercial tracts of land; single-tenant and mid-rise office buildings; shopping centers, malls, convenience stores; branch banks; hunting lodges, ranches, fruit orchards and more. We have completed assignments in Mexico for financial institutions, the U.S. State Department, law firms, Mexican and U.S. investors, insurance companies, and major U.S. corporations.